So [Jesus] got up from the table, took off his robe, wrapped a towel around his waist, and poured water into a basin. Then he began to wash the disciples' feet, drying them with the towel he had around him. "Get real, man!" is a slang expression intended to bring someone into reality — no exaggeration, no pretending, no imaginary tale. 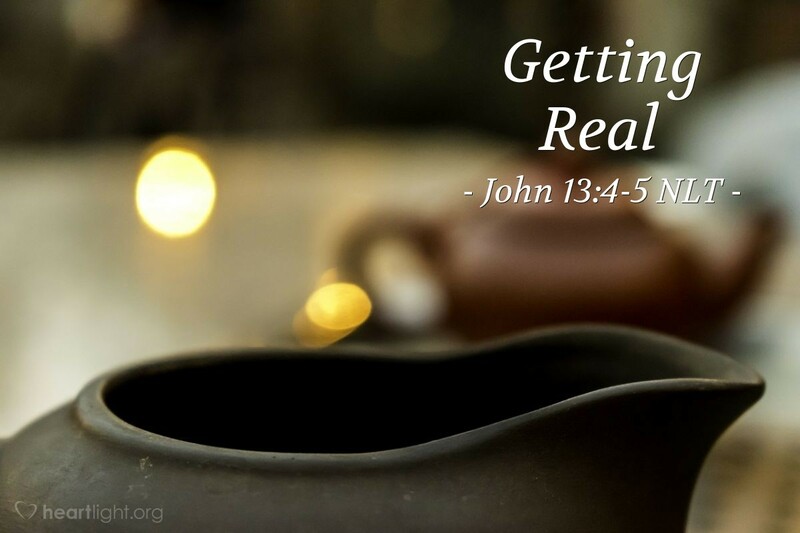 Jesus' washing the disciples' feet is a time when God's becoming human flesh "gets real." Jesus, God come in human flesh, takes water and washes the dirt and grime off his disciples' feet. God becomes soiled with the dirt and stench of the world to show his love to all — to the disciples, including even the treacherous Judas, to us, and to all his creation. The same dirt from which he made humanity is now the dirt he must wash away to recreate humanity. Jesus gets real! That, my friend, is the crux of the Jesus story — that God would come to our world to bring us to his home at such great cost. Will you believe that this incredible story is true? If you do, everything is different! Almighty and loving Father, I praise you for your work in creating me in your image. I thrill at the thought that you fashioned me in my mother's womb. I am overjoyed that you have re-created me new in Jesus. I thank you for being willing to get your hands dirty with the dirt of my world and my life to bring me home to you. In Jesus' name, I praise you. Amen.